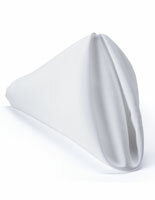 These Alluring Table Skirts are Designed to Fit Around the Edges of Tables! 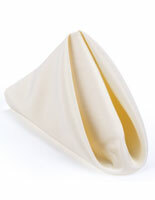 Tablecloths, Covers, and Linens are Available in Many Colors! With Such an Expansive Selection, Customers Know Where to Buy High Quality Table Skirts for Less! Skirting features deluxe box pleating. Table topper is designed for 6' long rectangular tables. Clips are included for attaching table skirting. 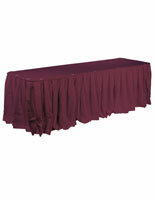 Table skirts are the preferred linens of both the hospitality and trade show industries. Tablecloths made from polyester have many advantages over runners or throws made from other fabrics. These table skirts, also known as linens, are much less expensive than covers made from more expensive, and sometimes less durable fabric. In addition to being cheaper than other materials, these tablecloths are wrinkle resistant and machine washable. 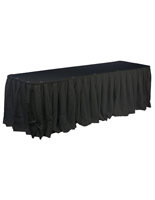 These table skirts are designed for repeated use in tough environments, such as trade show exhibitions or banquet dinners. Folding tables measuring 6'l x 30"h are fully covered by the table skirts. 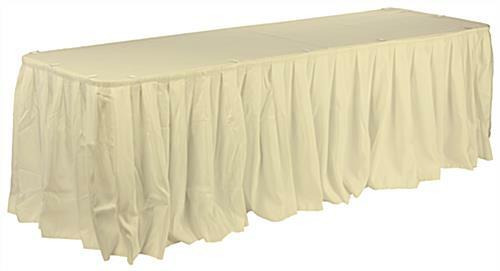 These tablecloths include a cover that is 54"w x 96"l. The table skirts are also supplied with additional skirting that covers the full height of tables. Hook and loop clips are included to attach the skirting. Tables in any setting look great when covered with these remarkable table skirts!